BUILT TO DO YOUR DIRTY WORK. Tough, affordable and easy to operate, Argo’s 2018 Avenger series commercial models are designed for demanding commercial uses and have what people need to get their job done. 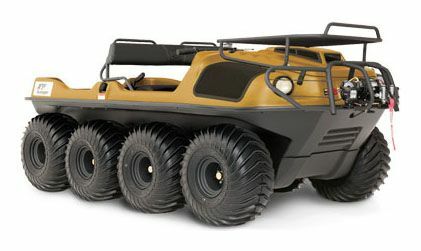 With a choice of either the multi-purpose Avenger 8×8 XT in construction yellow or the Avenger 8×8 XT Responder designed for reliable off-road search and rescue, both will crawl, swim or climb anywhere you have to go. WARN WINCH: ARGO’s 3,500 lb. (1,588 kg) Warn winch mounts front or back to assist with high-angle extraction of victims and equipment. Chain drive machined sprockets. 1 3/8 in. diameter axles with triple sealed greaseable outer bearings.